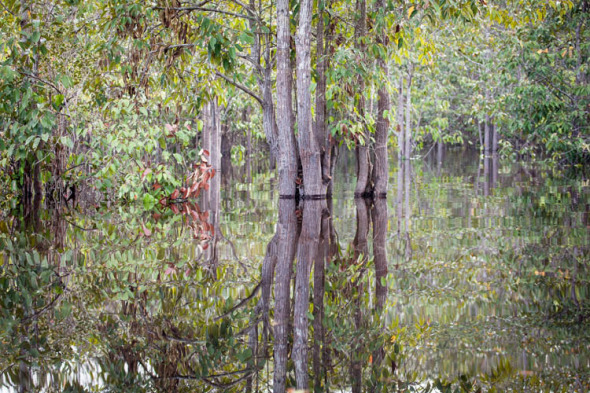 The southern half of the huge island of Borneo is dissected by a series of parallel rivers running from the mountains in the middle of the island to the Java Sea at the south. Almost all of the settlements (cities, towns and villages) sit alongside one or another of these rivers or their tributaries. The Barito, Kapuas, Kahayan, Katingan, Sampit are the biggest ones, and they ARE big rivers, especially at this time during the wet season. 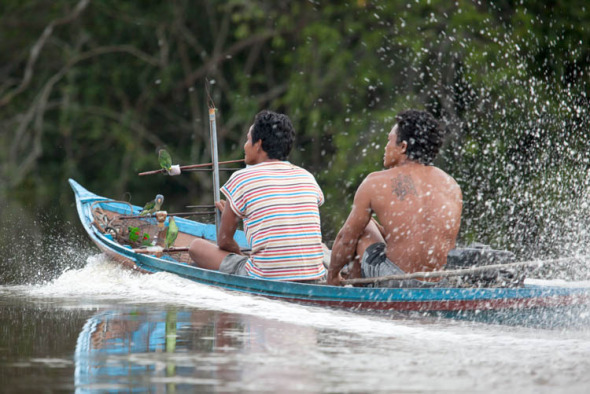 There is now a growing network of roads, including some with bitumen, but in the past the rivers were the only way of getting around in Kalimantan. 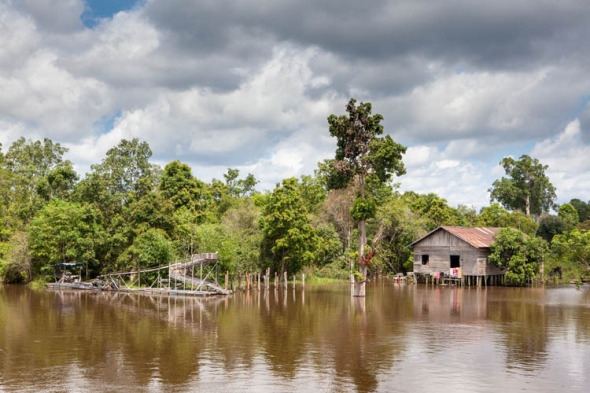 And villages such as Kanarakan (below), an hour upriver from us, are still only accessible by boat, and the roads to others become impassable during the wet. 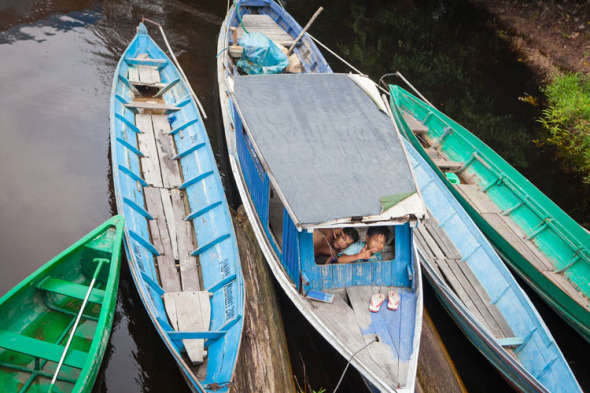 The rivers were (until recently) the arteries through which everything and everyone (traders, visitors, warriors, diseases, religions and politicians) flowed, and so the cultural and language divisions of Kalimantan are all based around the river catchments. 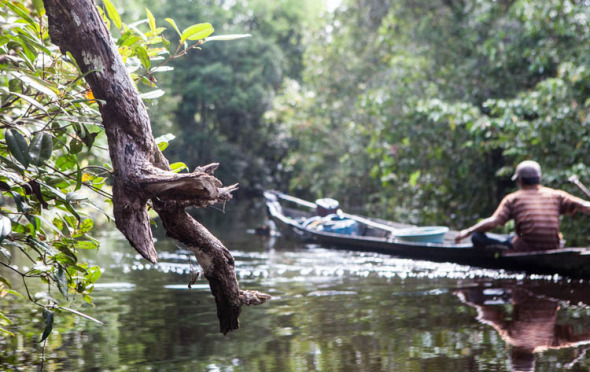 Two Dayak villages might be only 20km apart, but if they are on different river systems then they will speak different languages, and have quite different rituals, ceremonies and dances etc. Our ‘little’ river is the Rungan, a tributary of the much larger Kahayan River, which it joins near the provincial capital of Palangkaraya, 36km to the south of our home near Tangkiling. Tangkiling (above) is the largest of the cluster of seven villages here in the Bukit Batu sub-district. But when I say ‘largest’, I mean that it has a Post office, a health centre (but no doctor) and, on Saturday nights and early Sunday mornings, a little fruit and vegetable market where we buy our week’s supplies. Out on the river, it’s mostly forest and solitude, with only occasional settlements or encounters with other river travellers. But such interesting encounters! The Borneo Orangutan Survival Foundation (BOS) is based about 10km downstream from us at Nyaru Menteng. It is currently home to over 500 orang-utans, mostly rescued from captivity or orphaned (usually when their parents are killed by hunters). 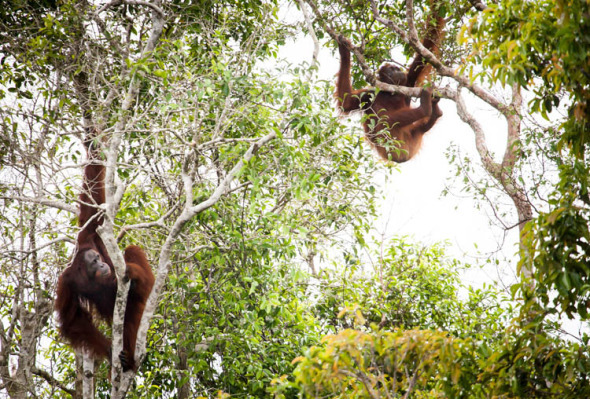 BOS aims to teach the young ones how to live back in the wild, in preparation for their release into remote forests in the north of Central Kalimantan. The last stage before their release involves them living on Kaju Island in the Rungan River (just about 2km from our home). There are about 50 there at present, with a big security presence protecting them the threats posed by predators, hunters, ranga-nappers – and photographers! 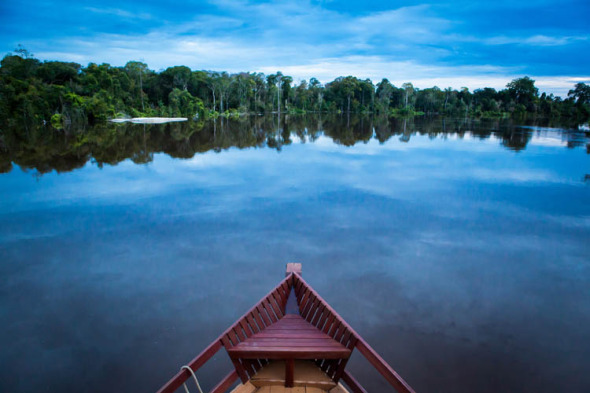 The most common transport is still the narrow canoe, known locally as a klotok. Nowadays they are usually motor powered, but there are still some older ones being rowed around, often carved from a single log. Speaking of illegal: the floating contraption on the left of the photo above is a gold dredge, one of several hundred on this river, which is only one of a dozen or more rivers with alluvial gold dredges. And every one of them is illegal. 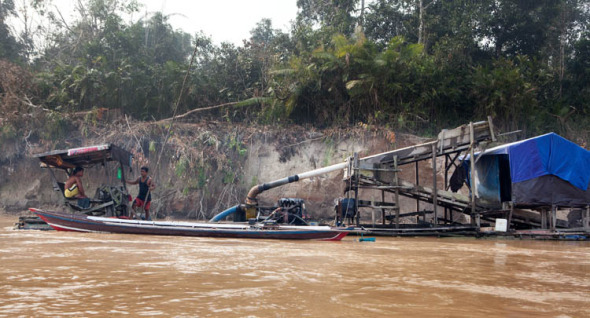 They pump sand, sludge and water up from the river bed, and run it down the ramps so that the heavier sediment containing some gold ore gets trapped in the carpeted floor of the ramps. At the end of the day the sediment is rinsed out from the carpet, wrapped up in silk, squeezed and treated with mercury to extract the gold. This thriving industry has a big environmental downside. The sand dredging creates big sandbanks in the channels of the river, and destroys the integrity of the river edges. And the huge amounts of mercury that end up contaminating the river have made river fish, especially the larger predatory species, quite unsafe to eat. Did someone say ‘illegal’? Most of the big forests around here have been cleared of big trees, but there is still plenty of logging going on in the forests up north in the ‘Heart of Borneo’. Not all of it is illegal, though there are frequent reports of corruption and questionable practices in the granting of logging concessions. 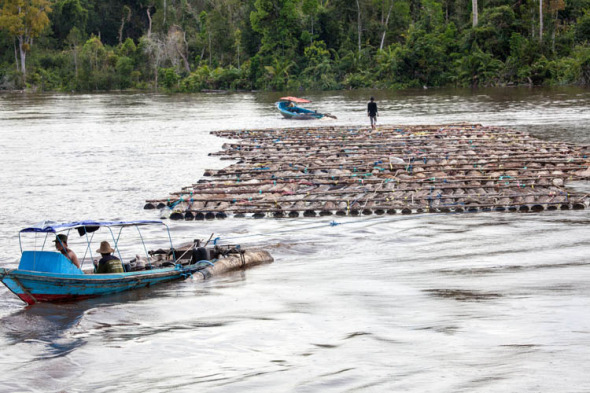 The logs are sent downriver in the form of huge rafts, the logs tied together with rope or rattan, and steered through the river bends by klotoks. The raft in the photo above is one of the smaller ones. There are not many of the traditional larger vessels (rangkang) on the river. They are still handmade in a couple of villages on the Katingan RIver (and maybe elsewhere), but they used to be the standard for transporting bulk freight and passengers on the rivers. 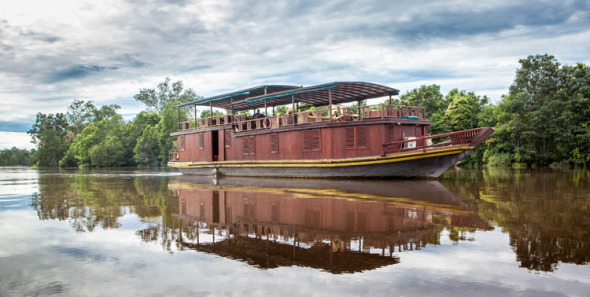 This one above is the Rahai’i Pangun, which has been converted for use as a cruise vessel for Kalimantan Tour Destinations, co-owned and operated by our friend and neighbour Gaye. Back in Tangkiling village, the riverfront is just as important as the road. 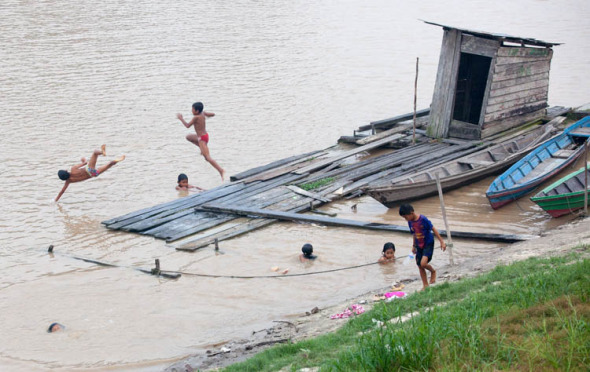 It’s where you go to launch your klotok, fish, bathe, wash clothes, use the toilet – and play. 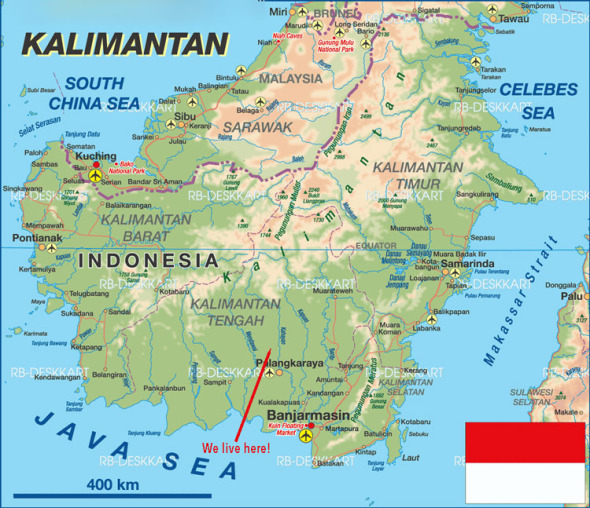 This entry was posted in General and tagged Central Kalimantan, Gold mining, Kalimantan Tengah, Kanarakan, Logging, Orangutans, Rungan River, Sungai Rungan, Tangkiling. Bookmark the permalink.